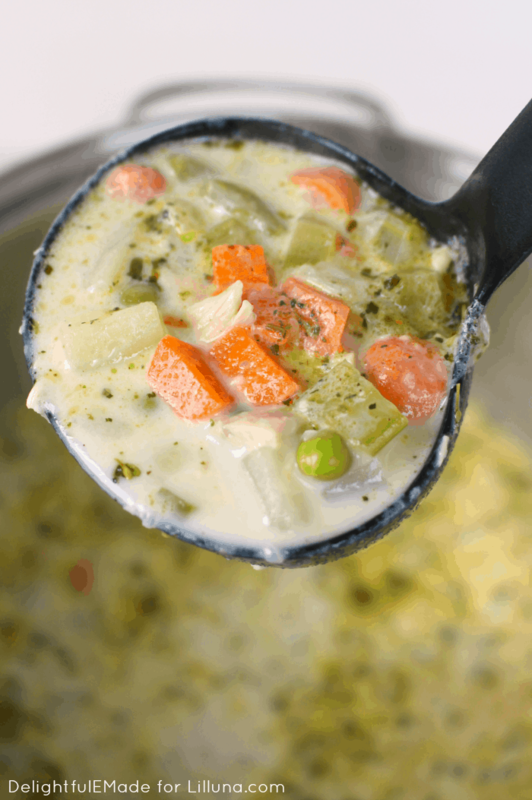 This creamy, delicious Chicken Pot Pie Soup can be made on the stovetop or in a crock pot! It has all your favorite vegetables, big chunks of chicken, and even seasoned pie crust crumbled on top. This is the ultimate comfort food right here!! As soon as the first cool, crisp days of fall set in, I’m all about making a really fantastic pot of soup. 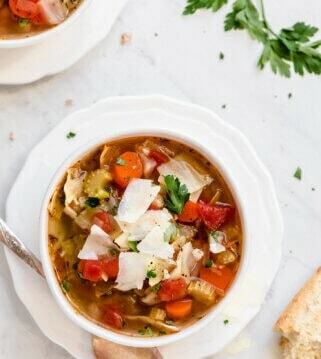 Soup is perfect to make any night of the week, and you’ll often find a big pot simmering away, especially on nights where we have baseball or football practice. 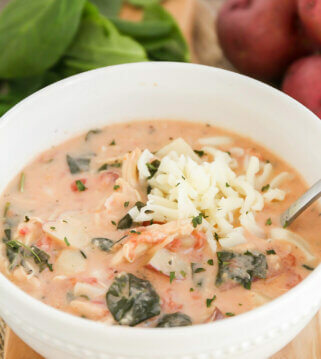 Coming home to a crock-pot filled with a hearty soup along with the delicious savory aromas is my idea of the perfect meal! 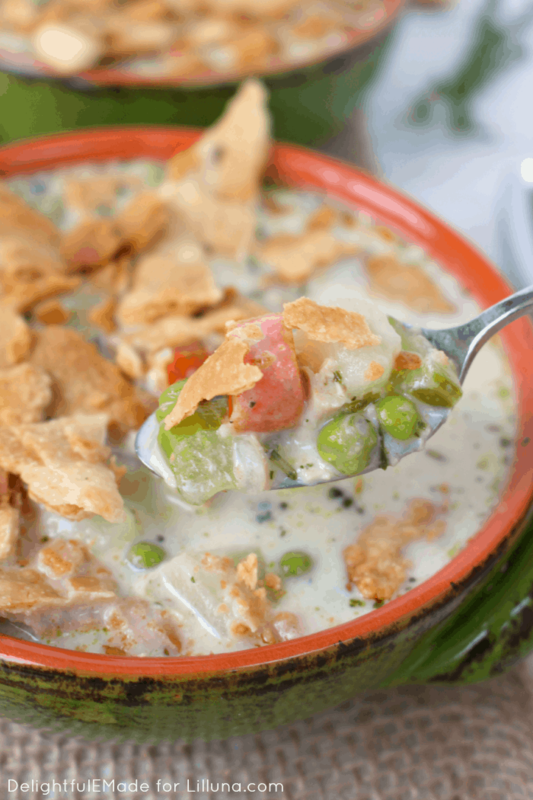 One of our favorite soup recipes to come to is this creamy, delicious Chicken Pot Pie Soup! It has all your favorite vegetables, big chunks of chicken, and even seasoned pie crust crumbled on top. Talk about the ultimate comfort food! 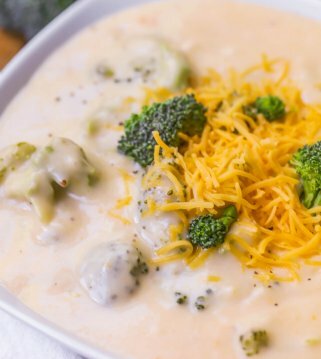 It’s the perfect bowl of soup to warm your tummy and soul! This Chicken Pot Pie Stew recipe is fantastic, as you can prepare it either directly on the stove top or in a slow cooker. I’ve made it both ways, and either method turns out wonderfully! 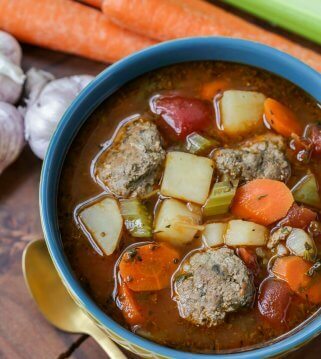 I enjoy using my slow cooker for soups and stews as you can do quite a bit of the prep work in advance, and let the veggies cook while you’re out and about. Once you’re ready to eat, you can simply add the last few ingredients, and dinner is set! Add all ingredients (except the half and half and corn starch) to the slow cooker. In the last 30 minutes, whisk the corn starch into the half and half and stir into the soup. Let cook for the last 30 minutes. Enjoy! Regardless of whether you make the soup in a slow cooker or on the stovetop, you’ve gotta top the soup with pie crust crumbles. To achieve that really wonderful chicken pot pie texture, I baked a simple store-bought pie crust on a cookie sheet and crumbled the crust over the top of the bowls of hot soup. In my opinion, the crust takes the soup from great to amazing!! Everyone in your family will be licking their bowls clean and coming back for seconds! 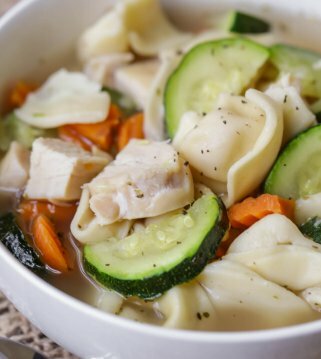 This soup has a wonderful creamy texture, hearty flavors and are perfect to warm your belly on a cold fall or winter evening! In a large stock pot, heat the olive oil over medium high heat. Add the onion, carrots and celery and saute for 7-10 minutes or until onions are translucent. Add the diced potatoes, peas, chicken and chicken broth and bring to a boil. Add the chicken bullion cubes, herbs de Provence, pepper and salt. Reduce heat, cover the pot and simmer for about 15 minutes. Stir occasionally. Preheat the oven to 425 degrees. Roll out the prepared pie crust and bake for about 5-10 minutes or until golden brown. Take out and let cool. When cool break the crust into pieces. In the last 5 minutes of the soup cooking, whisk the corn starch into the half and half. Pour into the soup and stir. Let simmer for the remaining 5 minutes. Soup is done when potatoes and vegetables are cooked through. Ladle into bowls and top with the pie crust. Enjoy! Slow cooker directions: Add all ingredients (except the half and half and corn starch) to the slow cooker. Stir together and cook for 6-8 hours on low, or 4 hours on high. In the last 30 minutes, whisk the corn starch into the half and half and stir into the soup. Let cook for the last 30 minutes. Enjoy! 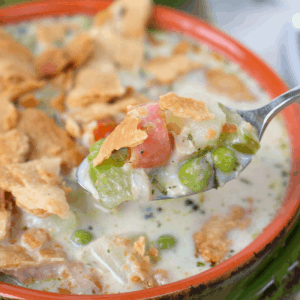 This soup looks like the ultimate comfort food. 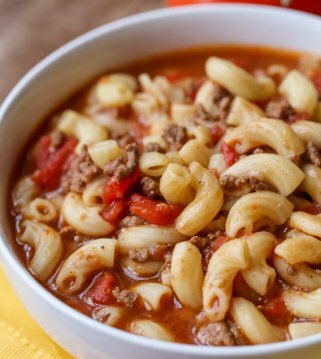 Definitely a recipe perfect for chilly fall days. Thanks, Erin, for sharing this recipe!! I just might have to try it in the near future. For more awesome recipes from Erin, head on over to Delightful E Made! In the 4th paragraph of your story line above, you mentioned that you place a store-bought prepared pie crust on a cookie. I’m pretty sure that you meant “cookie sheet”. But in the recipe itself, there is no mention of a pie crust. Are these just typos? I don’t see any mention of a pie crust in your ingredient list. Your story says a seasoned pie crust crumbled on top. Can you please tell me what seasonings I might put on top of it before I bake it. Thanks. 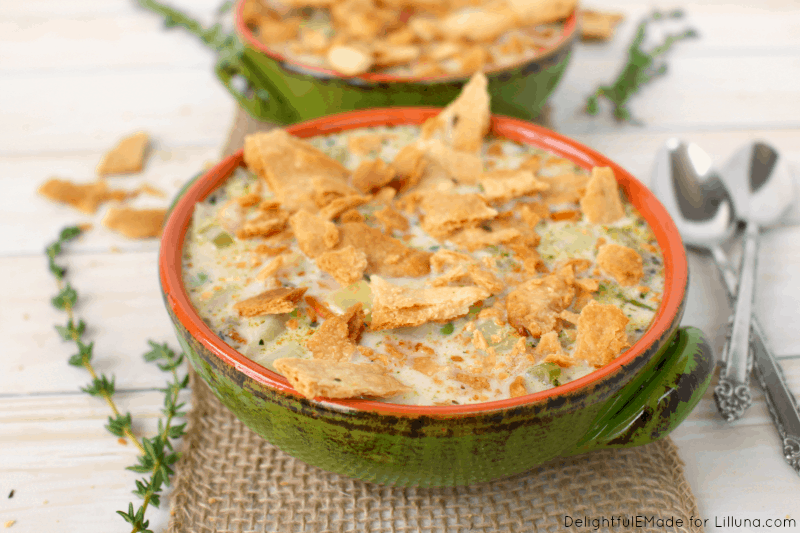 I am always on the lookout for a new soup recipe, and this one is definitely going on my list. Looks so yummy! In the ingredients you call for “1 (3 lb) can/carton chicken broth”. I don’t think I’ve ever seen a 3 pound can of chicken broth. Or don’t I know the abbreviation “lb”? This is absolutely delicious!!! The only changes I made were to soften the celery and carrots before I sautéed them and boil the potatoes before I sautéed them. And I did add some more cornstarch at the end because I like a more hearty thick soup. Fabulous recipe! Thanks for sharing! However, I only use pinterest, so they will all be in one place. Do you have a way to pin them?